Madagascar is the fourth largest island in the world - after Greenland, New Guinea and Borneo - and is about the size of Spain and Portugal combined. It lies in the Indian Ocean, separated from Mozambique on the African mainland by the 400km (248mi) Mozambique Channel. Unlike its volcanic neighbours - Mauritius, Réunion, Rodrigues and the Comoros - Madagascar was formed by continental drift rather than volcanic eruption (it tore off the African mainland around 165 million years ago). A narrow coastal strip in the east is where most of the rainforest grows; the central plateau in the high altitudes is cool; and there are plains and low-lying plateaus to the west. The international conservation community has singled out Madagascar as one of the ecologically richest countries on the planet. It has 90% of the known species of lemurs, and half the world's chameleons are found there. Add baobab trees, unique cacti and aloes from the dry areas, and you start to build up a picture of an incredibly rich ecology. Trade winds prevail from the east and the monsoons come from the north-west. Most of the rain hits the east coast and the far north, but in the rain shadow south-west of the highlands it remains almost perpetually dry. When humans arrived, they brought slash-and-burn agricultural techniques to clear the way, with barely 15% of the original forest cover remaining today. 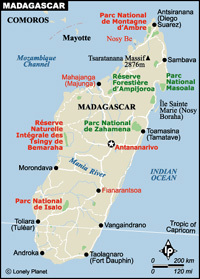 This has given way to severe soil erosion and descriptions of Madagascar as the Great Red Island. There is great pressure across its stunning bio-diversity as this traditionally poor country attempts to trade on something other than its natural resources. The answer may lie in recently improved agricultural techniques and the lucrative eco-tourism market which is beginning to catch on.